I've never shied from putting up bad reviews of Henry Reed's poetry. It's possible, even, to take some small, secret pride when Randall Jarrell calls Reed, in 1948, "a nap after dinner." Many critics find Reed to be too reminiscent of Auden and Eliot and, with the exception of his parodies, some even think Reed's work is altogether unoriginal, uninspired, or (like Jarrell) just plain tiresome. 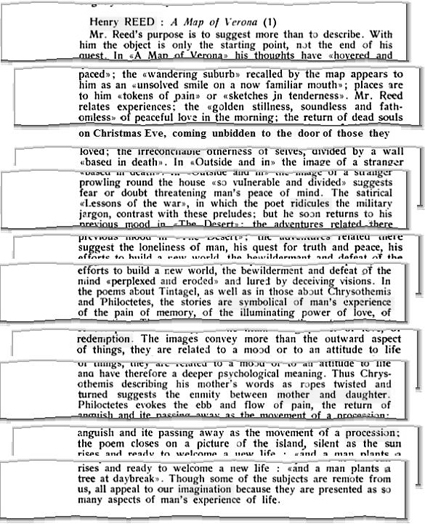 Still, almost without exception, most critics manage to find one or two poems which they can call insightful, unique, or skilled in execution. Such is the case with Herbert Lomas, reviewing Reed's Collected Poems for The London Magazine in 1992. Lomas recalls, upon reading A Map of Verona in 1946, that he found Reed "boringly written." He then proceeds to rediscover all the disinteresting adjectives and adverbs, the "clichés and doggerel," and "dim" language. At times, Lomas almost seems to be reviewing the introduction to the Collected Poems, rather than the poems, themselves: everything Stallworthy finds praiseworthy, Lomas finds at fault. 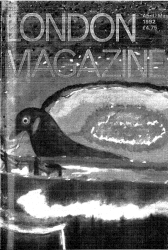 Herbert Lomas was born in 1924, making him nearly Reed's peer; more so, perhaps, since Lomas served in the infantry during World War II, including two years with the Indian Army's Garhwal Rifles, in the North-West Frontier. At the outset of his review, Lomas admits he "rejoiced" at Reed's "Naming of Parts," which must been repeated like a pop song by well-read soldiers of the Second World War. Indeed, here is a poem by Lomas himself, with a familiar-sounding voice: "Lincoln, Autumn 1943." Now, lest you think I am attempting some sort of argumentum ad hominem, I will add that Lomas does, in fact, have some very complimentary things to say about Reed's poems. "The Château"which Lomas quotes at length"has a plangent cadence, syntactical rhythms, a climactic long trail, and there is potential sublimity in the notion." This is Reed, "at his best." He is "extremely intelligent and gifted," and "no doubt charming," but his serious verse lacks, for Lomas, the smartness and surprising turns to be found in the humorous poems. Altogether, a not-entirely unfair assessment. Henry might even see the humor in this: a bad review for his birthday. The Collected Poems (ed. J. Stallworthy; OUP, £20) of the late Henry Reed puts the lie to the notion that he was a one-poem poet ('Naming of Parts') who also wrote a brilliant parody of T.S. Eliot, 'Chard Whitlow' ('As we get older we do not get any younger...'). He wrote some first-rate drama for BBC radio in the great days of the Third Programme (e.g. The Streets of Pompeii, and the famous Hilda Tablet plays). While it is true that he published only one collection during his lifetime, A Map of Verona in 1946, it was still being reprinted twenty-five years later. Reed is part of post-war English poetry for what he wrote in the Forties and Fifties; it's good to have him in print, and to see 'The Changeling', 'The Auction Sale', and all five of the 'Lessons of War'. He wrote less than he should have done, but he is worth saving for his distinctive note of exclusion from and loss of love, paradise, fulfilment. He turned, as so many of his contemporaries did, to the Mediterranean for all it could offer that England couldn't  'the Italian landscape of mythologised desire'. It is not only the soldier returning home at the end of 'The Changeling' to a lovely garden at dusk and a young wife in bed, but clearly Reed himself, who feels the force of rejection and disillusion at the close: '"All this is false. And I / Am an interloper here."' (Reed's homosexuality does not entirely account for the strength of his feeling.) This edition reprints his first book, adds about a dozen 'new' poems along with translations (particularly from Leopardi's Italian). Revue des Langues Vivantes, v. 14 (1948), p. 176. Over on Yahoo! 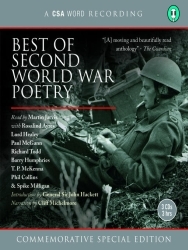 Music, I was shocked to find available, free for listening, all 118 poems from the album Best of Second World War Poetry (CSA Word Recording, 2007). Read by Rosalind Ayres, Phil Collins, Barry Humphries, Martin Jarvis, and Richard Todd, the anthology includes poems by Roy Campbell, Keith Douglas, Gavin Ewart, Sidney Keyes, and Terrence Tiller. Reed is, of course, represented by the ever-present "Naming of Parts," read by the actor Martin Jarvis. Individual tracks, or the entire album, are available for purchase from Rhapsody, and the Commemorative Special Edition CD set (shown above) is on the CSA Word website.